Meet the Poo-Gloo, the newest, greenest way to treat wastewater. 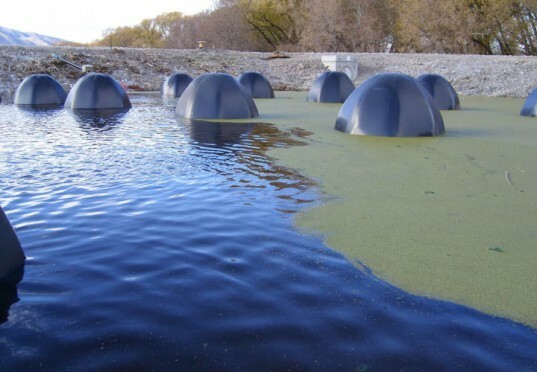 The igloo-shaped devices, officially named Bio-Domes, offer an affordable, sustainable way to clean up sewage just as effectively as multimillion-dollar treatment facilities. Designed by Kraig Johnson of Wastewater Compliance Systems, the six-foot-wide, five-foot-tall structures are lined with bacterial biofilm that cleans raw sewage. To maximize surface area for the bacteria, several plastic domes lined with biofilm are stacked on top of each other, like Russian nesting dolls. Then they are submerged in existing wastewater treatment lagoons that struggle to meet environmental standards. The heterotrophic bacteria eat most of the carbon-based materials while autotrophic bacteria chow down on ammonia and nitrogen compounds. Tubes within each device pump air bubbles throughout to keep the bacteria alive and circulate sewage. Johnson, the chief technology officer of the Salt Lake City-based Wastewater Compliance Systems, began designing the structures in 2002 when he worked as a research assistant at the University of Utah. Several towns across the nation have already begun using the domes to clean water in existing facilities. Johnson told Discovery that the installation of Bio-Domes runs between $100,000 and $200,000 — significantly cheaper than the several million it takes to build a new treatment plant. Plus, the devices cost a whole lot less to run: ten Bio-Domes require only one horsepower. Recently, an eight-horsepower system replaced a treatment plant that was using up to 60 horsepower and still couldn’t meet the environmental regulations. So how much poo can a Poo-Gloo system handle? Just as much as a wastewater treatment plant. Tests by the company show that organic waste and suspended solids in water were both reduced consistently by 85 percent; ammonia levels dropped by more than 98 percent in warm water and by as much as 93 percent when the temperature dropped below 50 degrees (conditions that usually slow sewage breakdown); and nitrogen levels fell 68 percent in warmer water and 55 percent in cooler water. The company has sold about 200 devices so far and has put full-scale systems in Plain City and Wellsville, Utah, as well as Jackpot, Nevada, and Glacier National Park in Montana. Bio-Domes are still pretty new, but as the company continues to develop and enhance the product, we’re sure to see them devouring a lot more crap. 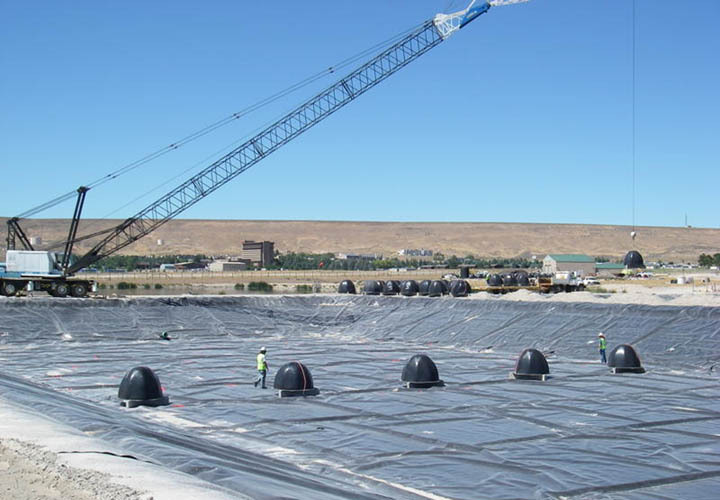 Bio-Domes being installed by crane in Jackpot, NV. Frozen foam columns appear on the surface of the wastewater treatment lagoon in Jackpot, NV as a result of the air-water mixture bubbling up through the ice during freezing conditions.